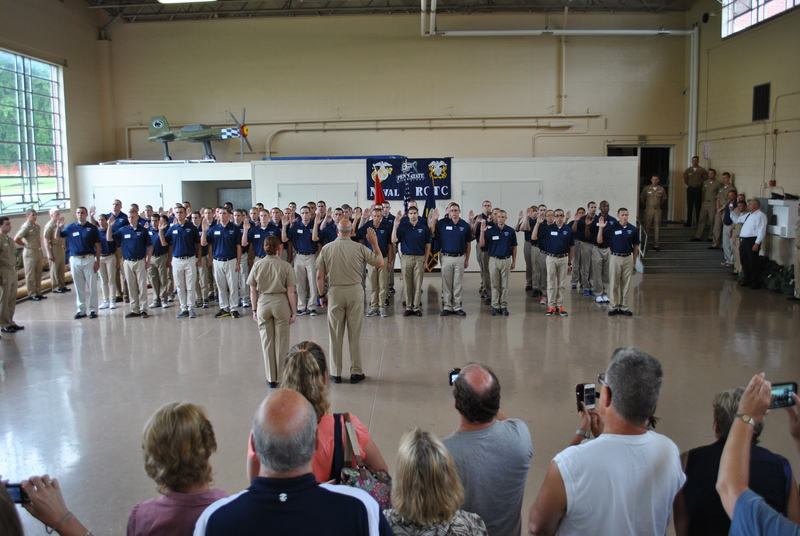 New Student Orientation is designed to welcome new members to the battalion and transform them from civilian college students to NROTC midshipmen. It is fully planned and run by midshipmen, emphasizing from day one the importance of peer leadership within the program. New students receive gear for the week upon arrival. Orientation requires students to focus and promotes discipline, as they receive information from their instructors immediately. After donning their first uniform, freshmen are put into formation and are officially sworn in as United States Navy Midshipmen. The week’s program involves physical training, classes orienting the students with the Naval Service and its constituent parts and their missions, and instruction in discipline and drill movements. Morning workouts encourage the new class to work together and motivate each other in preparation for their first physical fitness assessment, conducted at the end of the week. Topics ranging from basic Navy and Marine Corps knowledge to uniform wear and proper customs and courtesies are taught every day. Moreover, the students are at a civilian university, so much guidance is provided on time management, class scheduling, and general tips on student life. It is an intense week, intended to integrate the freshmen into their new role as members of the student Battalion, the Uniformed Services, and the Penn State student body. Click here for the New Student Orientation 2017 schedule. Click here for the 2017 Knowledge Packet Booklet.